Shiloh has hit an all time low. Yes….she’s still eating trash. In fact, our trash can is on the deck because that is the only way to prevent picking it up off the floor every time we come home. We are looking into other options since obviously the dog proof $40 trash can DIDN’T work! Cinnamon spray maybe? So this morning when I left I told her if she was really good when I got home from work I would give her the rest of the doggie whoopie pie I had bought her at Three Dogs Bakery. She clearly doesn’t listen because I came home to this…. 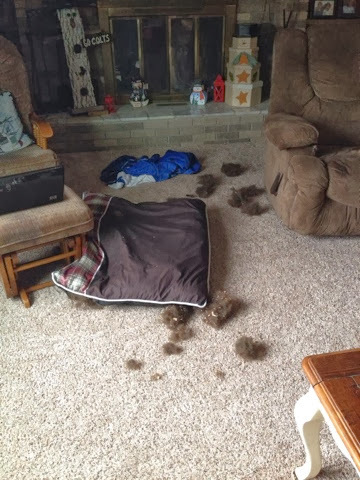 The dog bed she loves to lay on and has been in the living room for days and weeks is now in hundreds. So I yelled and screamed and she cowered and tried to cuddle me. Then I left for my Relay meeting and while I was gone she managed to hit her all time low. She actually got on the kitchen counter, which she has never done, and ate half the bag and the rest of her doggie great. I guess she showed me. She showed me she has a serious problem and that we need a new dog. A dog that doesn’t chew beds or couches and doesn’t eat trash or stuff off the counter.